This month was a slow reading month for me. A lot of fantasy was chosen and I don’t tend to read fantasy as fast as I do contemporary. Although, the contemporary book I read did take me a little while to finish. I’m really hoping that October will be a better reading month for me. I really don’t want to get off track of my reading goal! Each link will take you to my review of each book. Empire Of Storms by Sarah J. Maas: I really enjoyed this book. I cannot wait to see what happens in Tower of Dawn and Kingdom of Ash! Perfectly Imperfect by Harper Sloan: This was my least favorite book this month. Maybe even this year. Definitely won’t be picking up anything by Harper Sloan in the future. 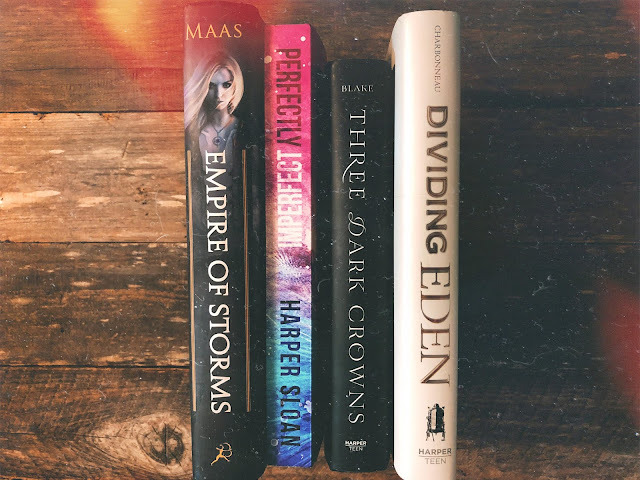 Three Dark Crowns by Kendare Blake: I was just really underwhelmed by this book. I wanted so much more from it. I’m not discouraged from reading the next books, but this one was a let down. Dividing Eden by Joelle Charbonneau: This book gave me everything that Three Dark Crowns didn’t. I really enjoyed everything this book had to offer. Can’t wait to pick up the next one! What books did you guys read this month?